This article was written By Rex Baylon on 09 Nov 2010, and is filed under Reviews. It’s a sad fact, but economic prosperity is built on the backs of people who will never get the chance to taste the fruits of their labor. In America, diverse ethnic populations that range from Africans who were brought into the country as slaves, the Chinese who toiled as miners and railroad workers during the California Gold Rush, and the various Europeans who labored in the booming industrial factories that were popping up everywhere in the country all had a hand in making America the First World country that it is now considered. During the immediate postwar period, Japan conscripted its young men into leaving their small towns and villages to work in the bustling cities that were just rising up from the rubble of the War years. These “golden eggs”, really just boys right out of middle school, were promised the world but once services were rendered, all the promises that were made were quietly brushed under the carpet. Japan, like America, had no feasible plans on how to assimilate the innumerable mass of poorly educated and ill-prepared young men into mainstream society. 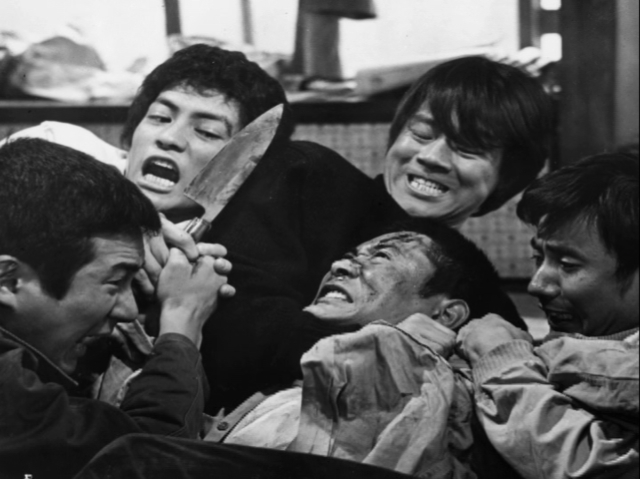 Kinji Fukasaku, cinema’s patron saint of angry youth, set out to capture on film through a mix of documentary realism and avant-garde visual flourishes a group of “golden eggs” as they struggle against the system. 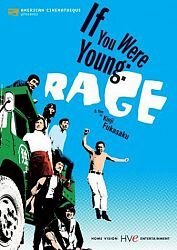 Kimi Ga Wakamono Nara (If You Were Young: Rage) was one of a handful of films Fukasaku made away from his home studio, Toei, during the late 1960’s. Produced through his own independent production company, Shinsei Eigasha, and released theatrically in 1970 by Shochiku studios, the film sticks out in Fukasaku’s vast oeuvre. In fact, the film itself was thought to be lost or, at best, obscured by the genre fare that Fukasaku was much more famous for until his Batoru Rowairu (Battle Royale), made in 2000 but not released theatrically in the states until 2001, awakened in Western cinephiles a hunger for all things Fukasaku. Although he had gone outside and shot on-location before, it was with If You Were Young: Rage that Fukasaku truly indulges in capturing, with his lens, scenes of Japan, from the modern buildings and skyscrapers to the simple beauty of the seas which surrounded the country’s shores. 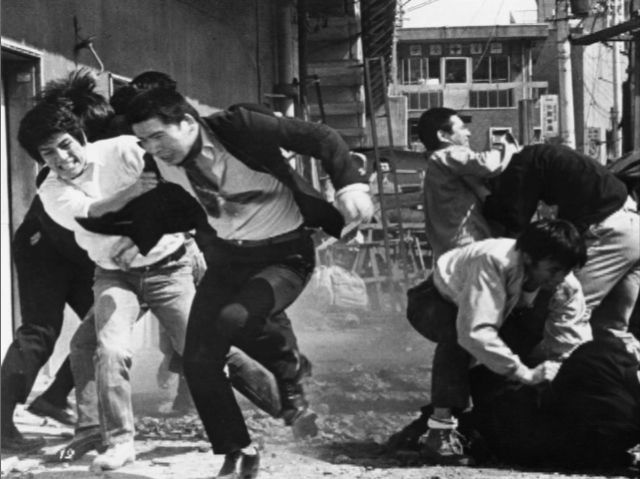 Fukasaku’s camera lingers on the everyday banal activities of the working class and If You Were Young: Rage at the very least is a wonderful cinematic document of 1960’s Japan. Asao (Gin Maeda) and Kikuo (Tetsuo Ishidate), the main characters of the story, are unlike the typical Fukasaku protagonist in that they are not part of the criminal milieu nor can they be categorized as being apathetic or nihilistic. Of the 65 films that he has made, Asao and Kikuo may be the most optimistic and well-adjusted of characters to appear in a Fukasaku film. In an interview done right before his death Fukasaku elaborated on the film’s genesis and the central themes within the film. He goes on to further elaborate that the main theme within the film is the issue of trust. That, although Japan’s youth culture may have lost faith in institutions like school, government, and family, none of the characters ever loses hope in themselves and their own capabilities. Society may not change but that does not mean that their situations can’t improve for the better if they work hard. At the start of the film we are introduced to 5 “golden eggs”. Longtime friends Asao and Kikuo, Kiyoshi, a fisherman’s son with a fear of the sea, Ichiro, the son of a factory worker, and Ryuji, a man whose rural upbringing has left him figuratively scarred with a bad stutter. These five men form a friendship due to the dire situation they all find themselves in. With the factory they had worked in closed and their dorm about to be sold off, they have nothing and no one to rely on but each other. Their salvation comes through a random comment made by Kiyoshi while the 5 friends are stuck in jail, and upon their release they make a pact to pool all their money together, buy a dump trump, and go into business together. Of course, as noble as their goal is, real life intrudes on their dreams and, one by one, each man drops out for varying reasons. Kiyoshi is sent to prison for manslaughter, Ichiro gets his girlfriend pregnant, and, irony of all ironies, Ryuji working as a strikebreaker ends up getting killed when he comes to the aid of some strikers being savagely beaten by the cops. Eventually the only two left are Asao and Kikuo and they do manage to purchase their own dump truck and for a brief time are able to savor the sweet taste of financial freedom. Within this film Fukasaku presents a very complicated viewpoint of being part of a group. Asao, Kikuo, Kiyoshi, Ichiro, and Ryuji start off as brothers in arms primarily because each man has nothing and thus everybody is on equal footing with one another. As soon as Asao and Kikuo begin to branch out and move up in the economic ladder, though, they begin to find their bonds to their former comrades as troublesome and soon their view of their friends quickly turns bittersweet. It’s a telling sign that the only friend they have any fond memories of is Ryuji, whose death practically cemented his stalwart place in Asao and Kikuo’s memories. Ichiro and Kiyoshi’s entrance back into Asao and Kikuo’s lives after they’ve purchased the dump truck is presented as obstacles within the story. Just as he would later show in his celebrated jitsuroku-eiga, Fukasaku presents the group both as a place of security as well as being a rigid and constricting construct. Although all 5 men found solace in each other at the beginning of the film it’s their association with one another that ultimately leads to their tragic best online casino fates. It’s also interesting to note that Asao and Kikuo, like many typical Fukasaku protagonists, are men who’ve grown up without fathers. To survive, Asao’s mother turns to prostitution and, although this choice allows her son to enjoy some financial security, it leads to Asao suffering from deep psychological scars. And, in the case of Kikuo, his entire family is killed while he is still a young boy and thus has to rely on Asao and his mother to be his family. Robbed of a father figure to guide them during their adolescence, Asao and Kikuo are in a state of arrested development, and, as he did before and would continue on with his later films, Fukasaku traces our need to create bonds and form friendships as a way to create makeshift families and fill that emotional void in our lives. Ladensembjetve With all this said, though, Asao and Kikuo are not beaten down from all that they’ve suffered. In fact, the film is brimming with energy. Fukasaku’s camera is constantly moving, tracking the action with kinetic hand held shots that are reminiscent of cinema verite, and combined with the familiar use of freeze-frames, color filters, jarring cuts, and canted angles give the audience a real visceral experience. A recurring image that runs throughout the movie and can be seen in Fukasaku”s non-Toei productions is the use of the sea as a visual motif. In Blackmail Is My Life, the sea is a playground. Shun Muraki (Hiroki Matsukata) and his friends used the beach and the ocean as their personal playground: racing their expensive sports cars through the sand, clowning around in the ocean, and reverting back into a state of childlike bliss once away from the city. Then, in his 1969 film, Kurobara no Yakata (Black Rose Mansion), the beach becomes a place for emotional revelations with the brooding loner Wataru (Tamura Masakazu) finally confessing his feelings to femme fatale Ryuko (Akihiro Maruyama) and then passionately making love to her on the sand with the waves crashing against the shore as they finally consummate their love. In If You Were Young: Rage, though the sea comes to represent both an innocent tranquil space and a violent and unforgiving entity, it indiscriminately takes lives and drastically changes fortunes. Examples of this can be seen in things like the character of Kiyoshi who has a phobia of the sea after his father was killed in a storm, thus forcing him to seek employment in the city. His weak-willed nature though makes him ill-prepared to survive in the urban environment prompting him to request Asao to take him back to his hometown to catch sight of the sea one final time. A request which paves the way for the tragic finale at the beach with Kiyoshi dead, the dump truck a flaming wreck, and Asao and Kikuo’s friendship in tatters. Also, a scene at the beach with Asao and Kikuo as they spend the day with Yukiko quickly turns sour when Kikuo brings up painful memories from Asao’s childhood, resulting in a distraught Asao to run head first into the sea, fighting the waves in a poor attempt to cleanse himself of the past. One can’t help but make the connection that the sea, within these 3 films, is representative of youth culture itself: given to violent whims, passionate, and, oftentimes, terrifying. Fukasaku, without ever glorifying youth culture, paints it as a movement of idealists whose hopes are dashed because dreamers cannot survive in a world where people are reduced to commodities to be used and exploited all in the name of progress.